The Amara Piano Quartet is the successor to the Ames Piano Quartet, whose distinguished performing history spanned the last thirty-six years. Upon the retirement of two of its original members in 2012, the Quartet was renamed “Amara,” a name connoting mythic paradise in Abyssinian. 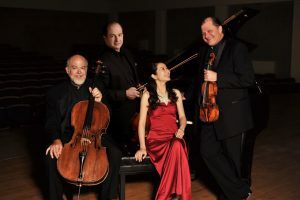 A second notable collaboration was with Texas Tech University composer Peter Fischer, whose 2015 Piano Quartet was written for the Amara Piano Quartet. The group gave dual premiere performances of the new Quartet in Iowa and Texas in February 2016. The Amara Quartet performs the masterpieces from the standard repertoire as well as new music (the group’s new recording of the two Faure Piano Quartets is scheduled for release in August 2018.) It also continues to research unjustly neglected piano quartets from the past. Like its predecessor the Ames Piano Quartet, the Amara performs little-known gems such as the Suk Piano Quartet, the Frank Bridge Phantasy, the Herbert Howells Piano Quartet, and similar. The Amara Piano Quartet is managed by Joanne Rile Artists Management, of Philadelphia.